4 So, Where are we going? 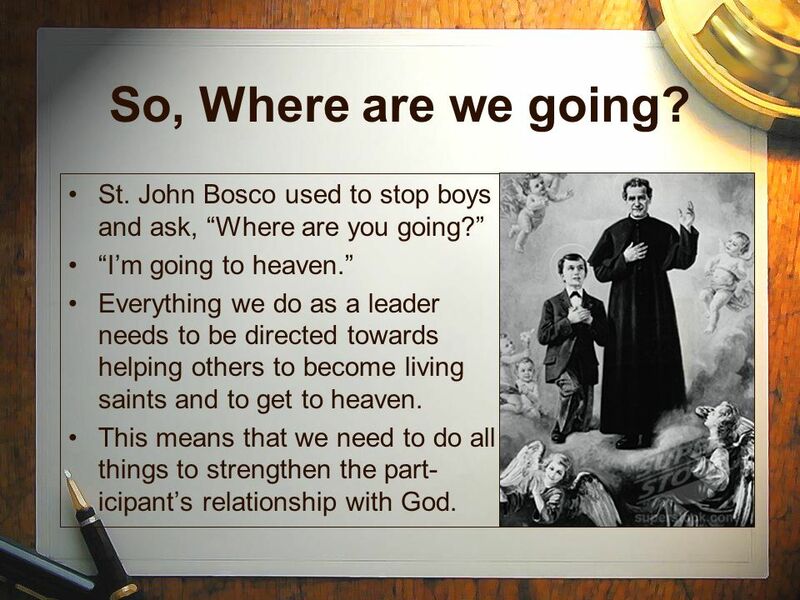 St. John Bosco used to stop boys and ask, “Where are you going?” “I’m going to heaven.” Everything we do as a leader needs to be directed towards helping others to become living saints and to get to heaven. 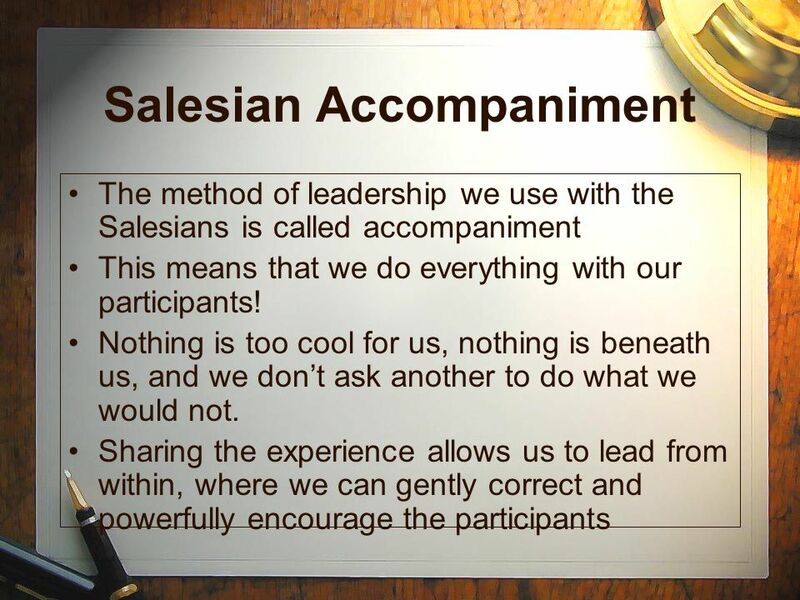 This means that we need to do all things to strengthen the part-icipant’s relationship with God. 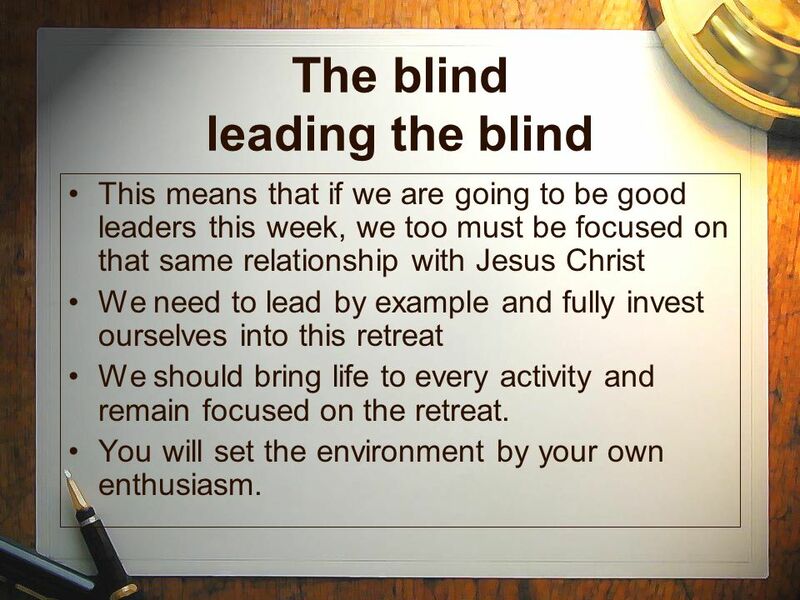 This means that if we are going to be good leaders this week, we too must be focused on that same relationship with Jesus Christ We need to lead by example and fully invest ourselves into this retreat We should bring life to every activity and remain focused on the retreat. 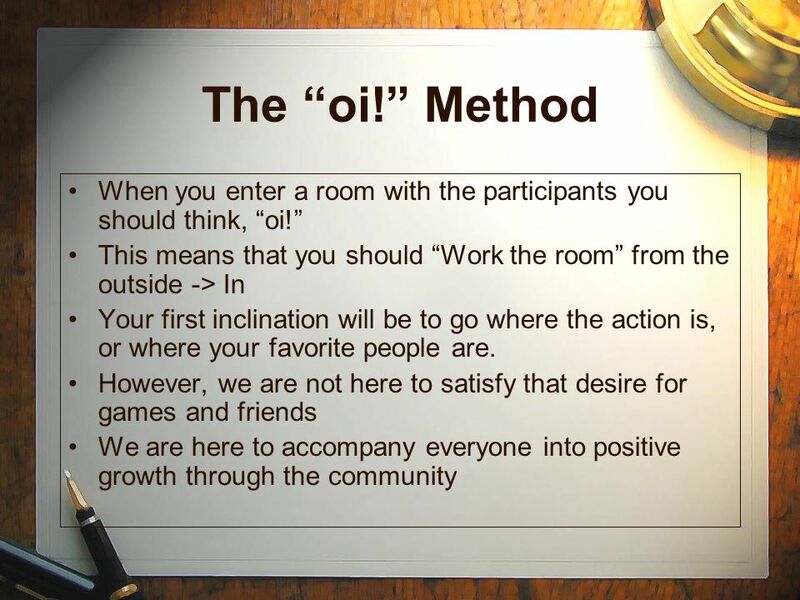 You will set the environment by your own enthusiasm. 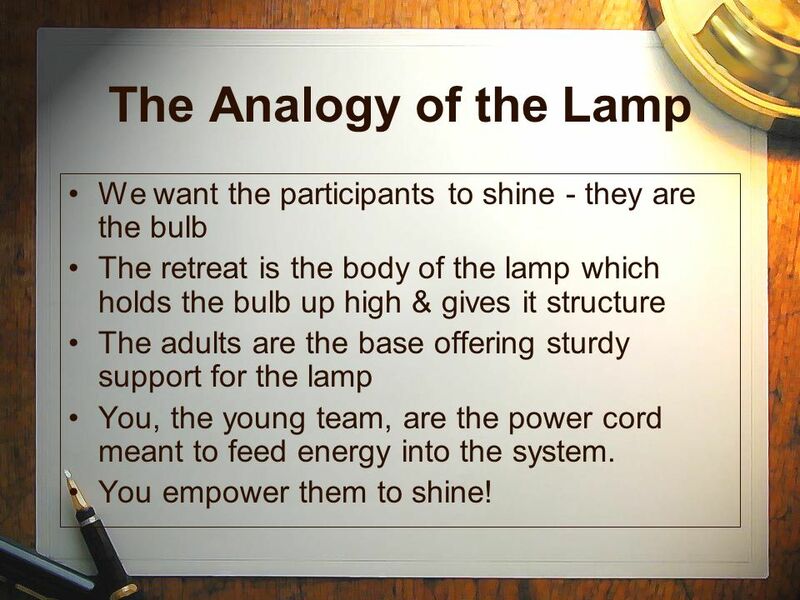 7 The Analogy of the Lamp We want the participants to shine - they are the bulb The retreat is the body of the lamp which holds the bulb up high & gives it structure The adults are the base offering sturdy support for the lamp You, the young team, are the power cord meant to feed energy into the system. 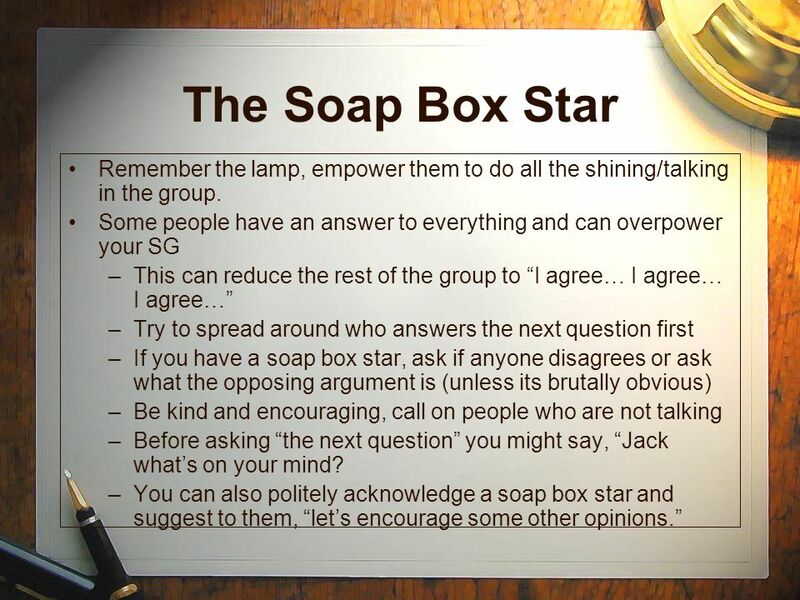 You empower them to shine! 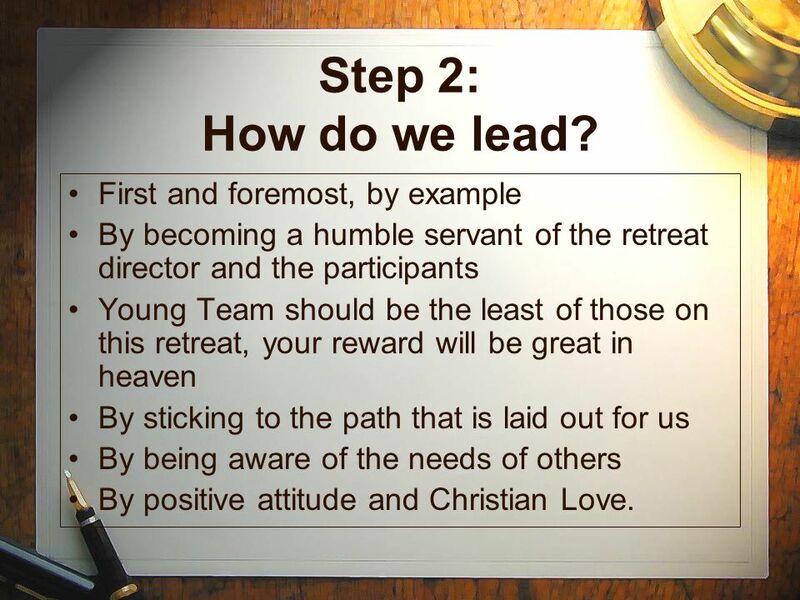 By becoming a humble servant of the retreat director and the participants Young Team should be the least of those on this retreat, your reward will be great in heaven By sticking to the path that is laid out for us By being aware of the needs of others By positive attitude and Christian Love. 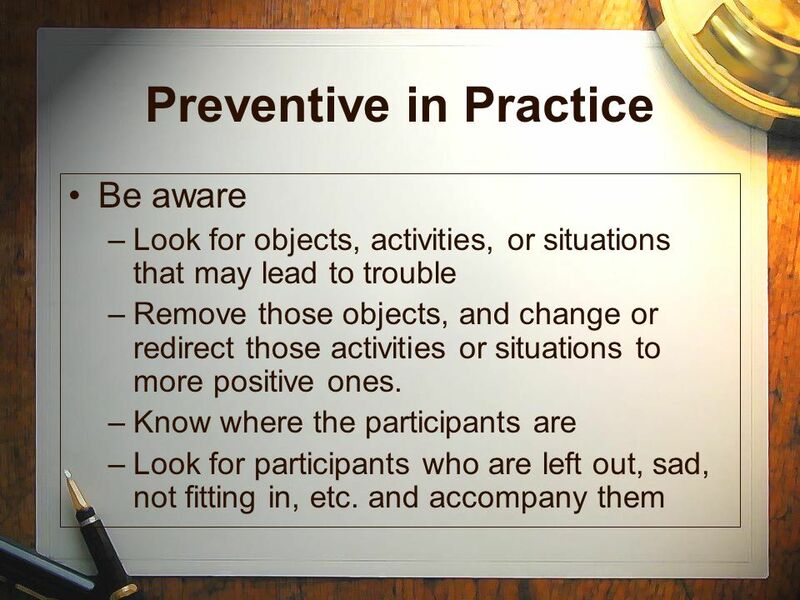 Be Proactive Young team MUST anticipate! 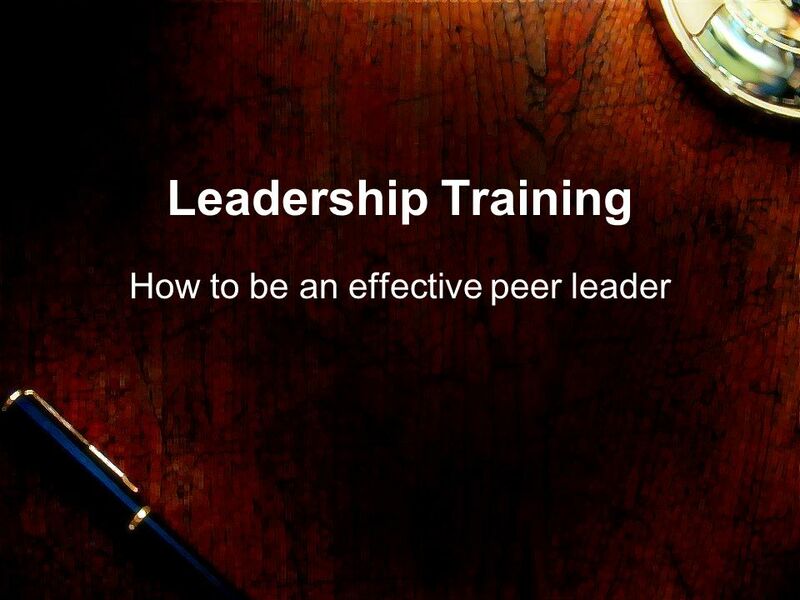 Anticipate the needs of the participants Anticipate the needs of the director Seek to be helpful Prevent drama! Don’t cause or magnify it! 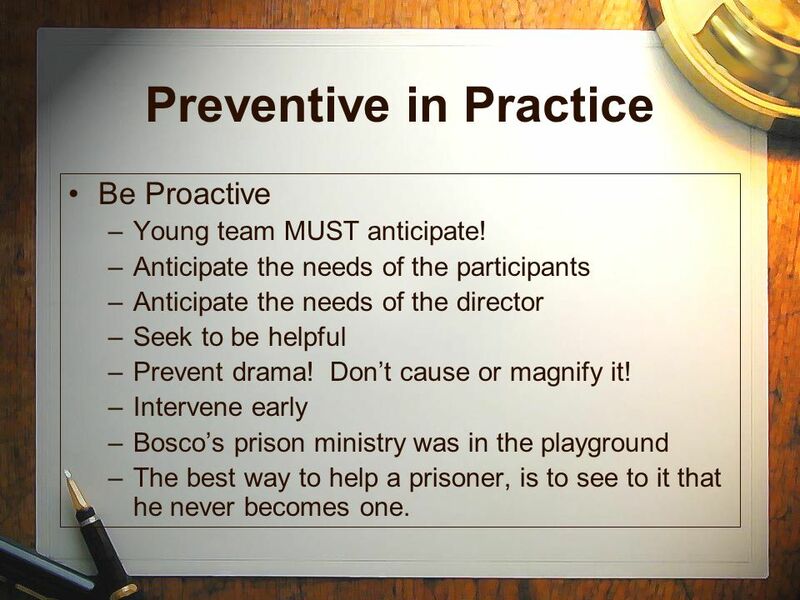 Intervene early Bosco’s prison ministry was in the playground The best way to help a prisoner, is to see to it that he never becomes one. 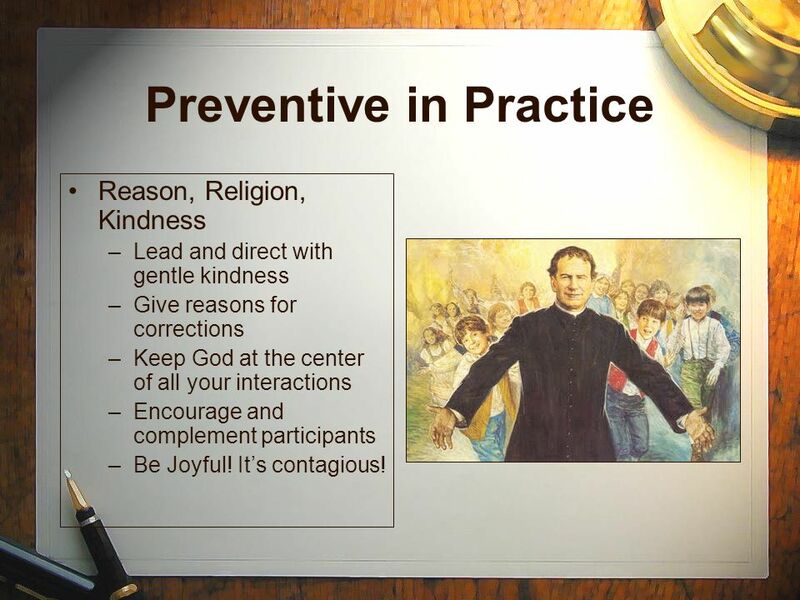 Reason, Religion, Kindness Lead and direct with gentle kindness Give reasons for corrections Keep God at the center of all your interactions Encourage and complement participants Be Joyful! It’s contagious! 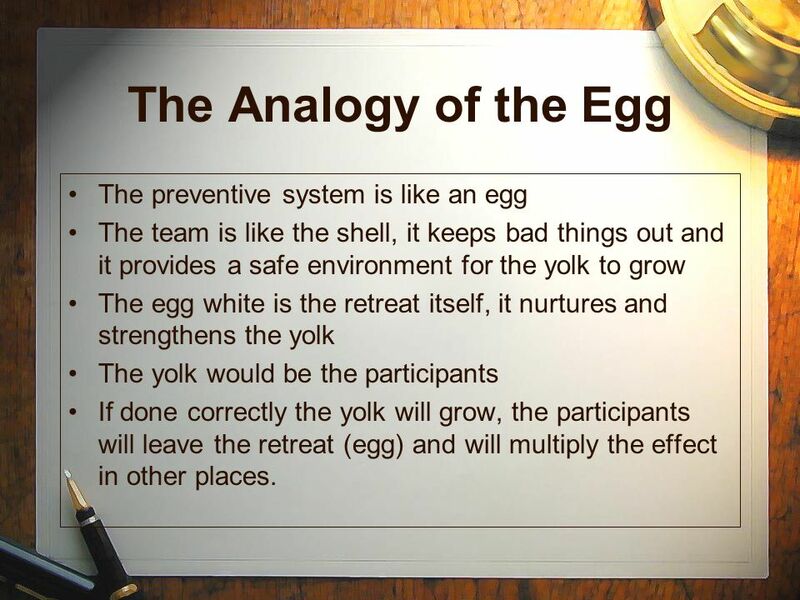 The team is like the shell, it keeps bad things out and it provides a safe environment for the yolk to grow The egg white is the retreat itself, it nurtures and strengthens the yolk The yolk would be the participants If done correctly the yolk will grow, the participants will leave the retreat (egg) and will multiply the effect in other places. 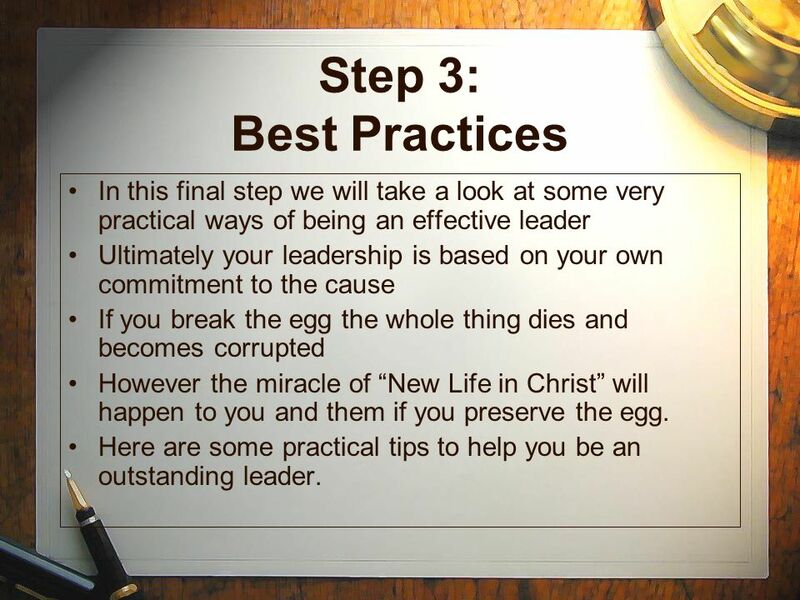 15 Step 3: Best Practices In this final step we will take a look at some very practical ways of being an effective leader Ultimately your leadership is based on your own commitment to the cause If you break the egg the whole thing dies and becomes corrupted However the miracle of “New Life in Christ” will happen to you and them if you preserve the egg. 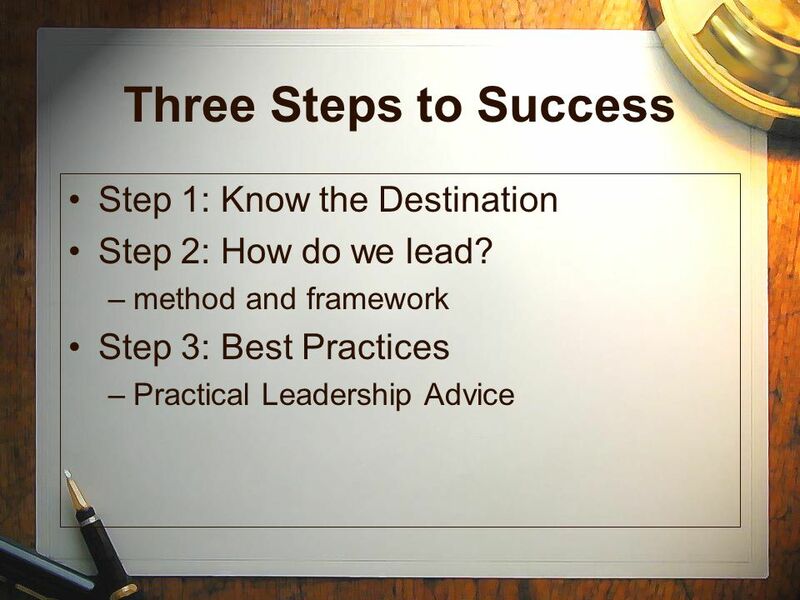 Here are some practical tips to help you be an outstanding leader. 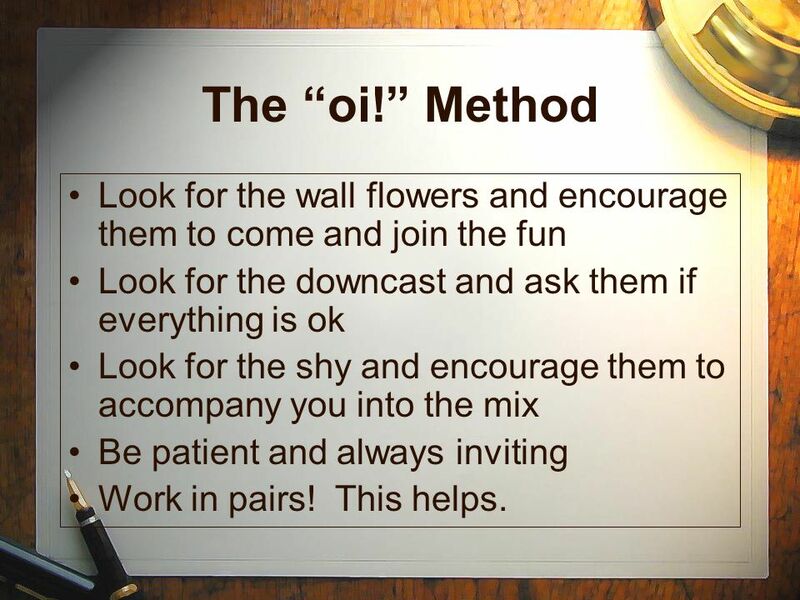 17 The “oi!” Method Look for the wall flowers and encourage them to come and join the fun Look for the downcast and ask them if everything is ok Look for the shy and encourage them to accompany you into the mix Be patient and always inviting Work in pairs! This helps. 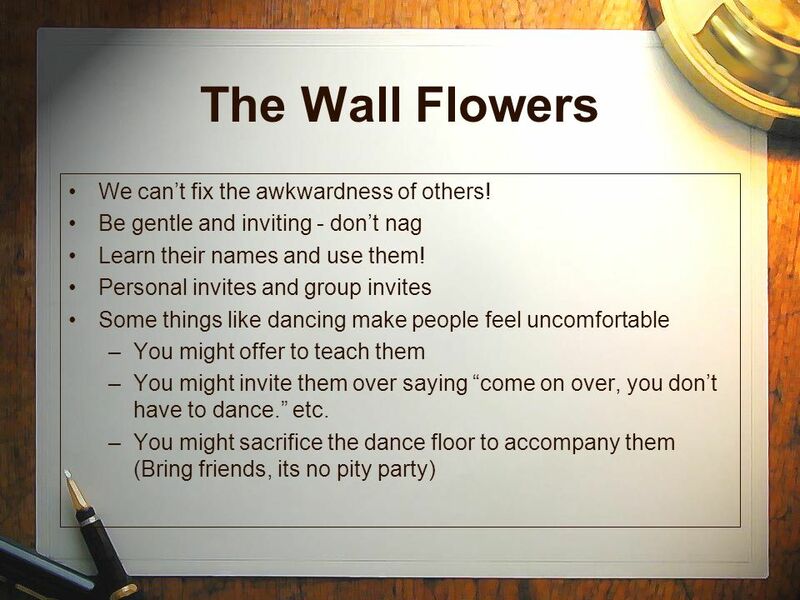 18 The Wall Flowers We can’t fix the awkwardness of others! 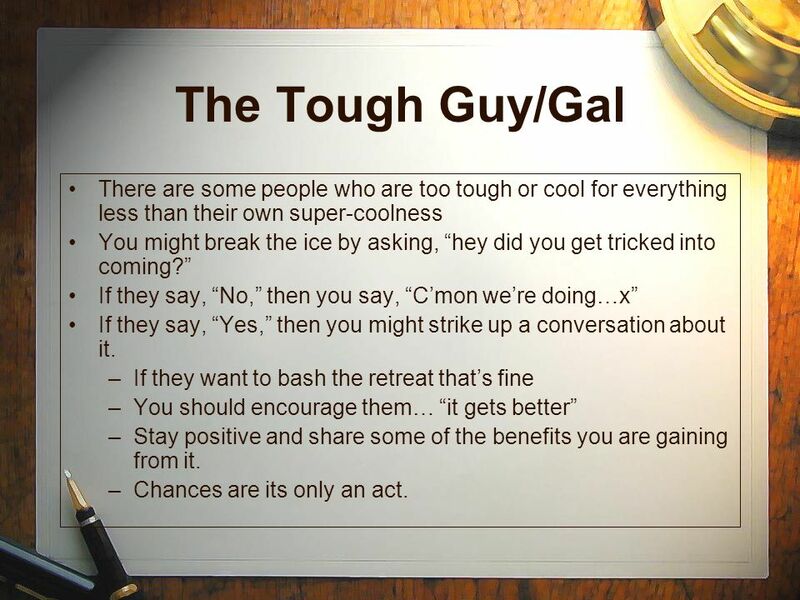 19 The Tough Guy/Gal There are some people who are too tough or cool for everything less than their own super-coolness You might break the ice by asking, “hey did you get tricked into coming?” If they say, “No,” then you say, “C’mon we’re doing…x” If they say, “Yes,” then you might strike up a conversation about it. 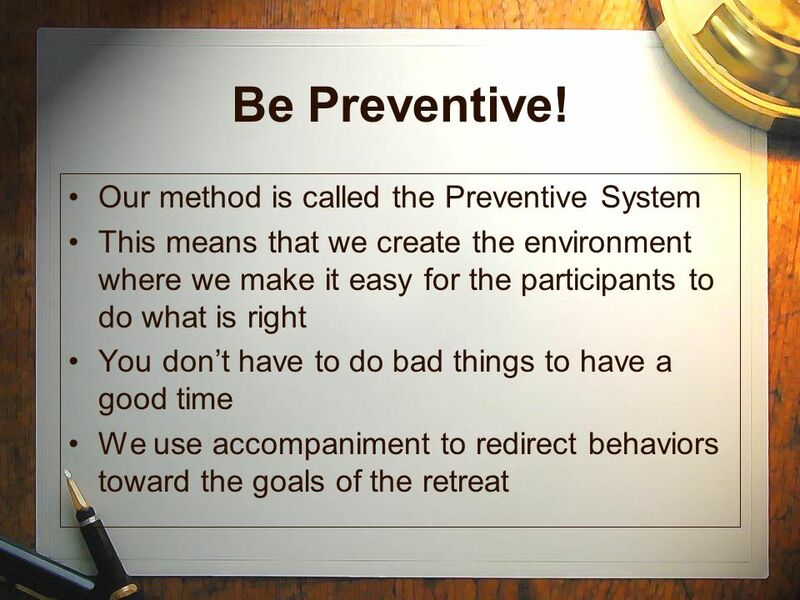 If they want to bash the retreat that’s fine You should encourage them… “it gets better” Stay positive and share some of the benefits you are gaining from it. Chances are its only an act. Don’t be shy, ask the question, expect the answer! When you give up, they give up! 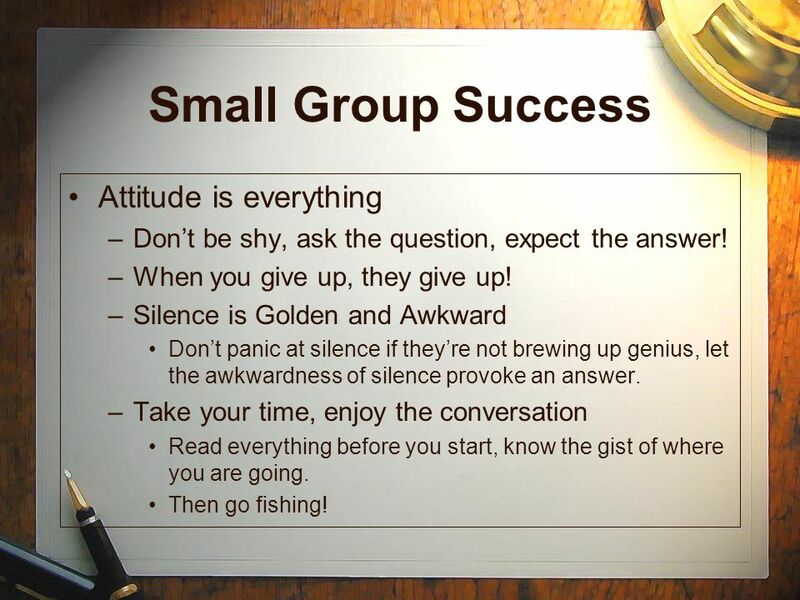 Silence is Golden and Awkward Don’t panic at silence if they’re not brewing up genius, let the awkwardness of silence provoke an answer. Take your time, enjoy the conversation Read everything before you start, know the gist of where you are going. Then go fishing! 24 Personal Success Don’t forget that you’re on retreat too! Immediately begin praying for the people you meet. 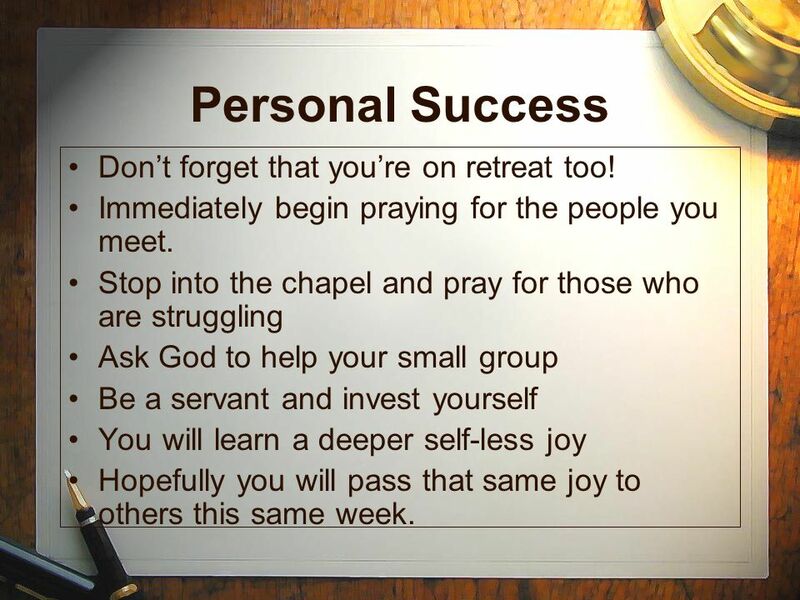 Stop into the chapel and pray for those who are struggling Ask God to help your small group Be a servant and invest yourself You will learn a deeper self-less joy Hopefully you will pass that same joy to others this same week. 25 Use the Adult Team Finally, you are not alone. This week you have an amazing adult team to help you out. The priests The Director and Assistants The Pre-Novices Don’t try to solve every problem yourself, use these people for both advice and assistance! Thank you for your sacrifice and your hard work! 26 Why do cows dress differently? They have their own brands! Any Questions? 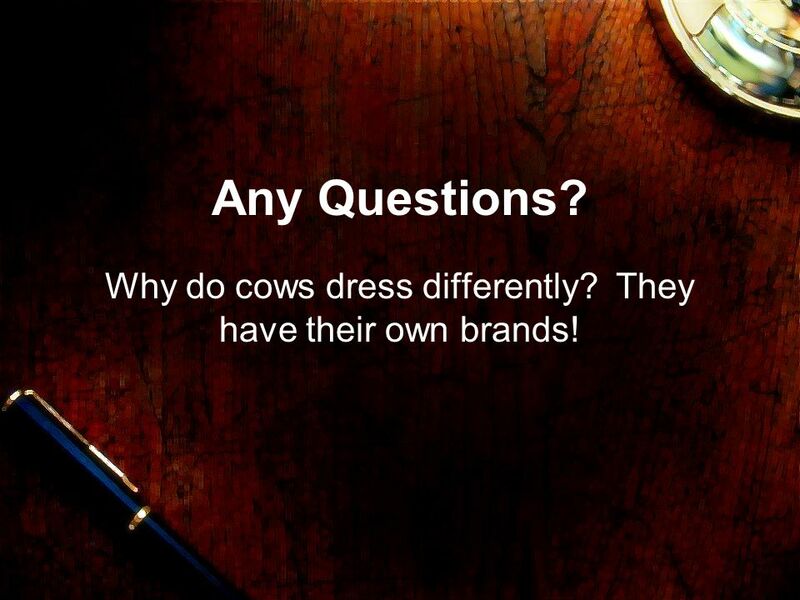 Why do cows dress differently? They have their own brands! Download ppt "How to be an effective peer leader"
Enabling the Dreams of Others The Ideas of Randy Pausch Author of The Last Lecture Photos taken by Debra Austin at Erie Balloon Festival 2008. Self – respect and Self – assertion Ms. Jayalakshmi R.
Don Bosco Teenage Care Presentation. Principles Which we live and work…… The Young Person First “The young must not only be loved, they must be able to. 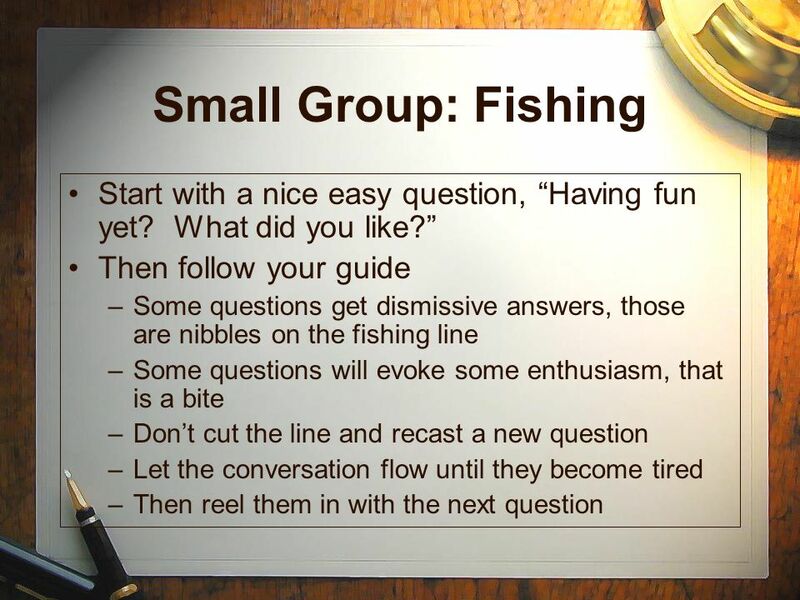 Welcome to Alpha Training Leading Small Groups First, some preliminaries. 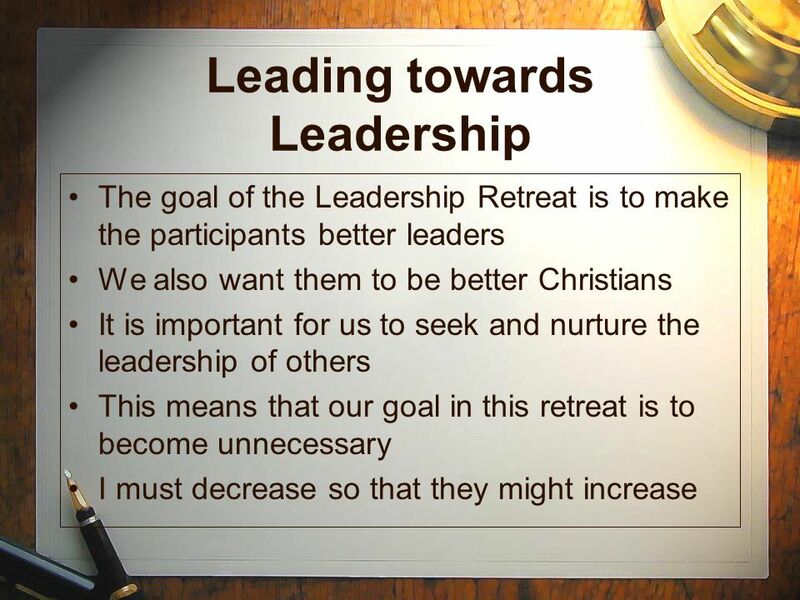 WORKSHOP 1: ADOPTING A SCRIPTURAL ATTITUDE THE SERVANT LEADER Sets the Right Priority Serves With The Right Attitude. 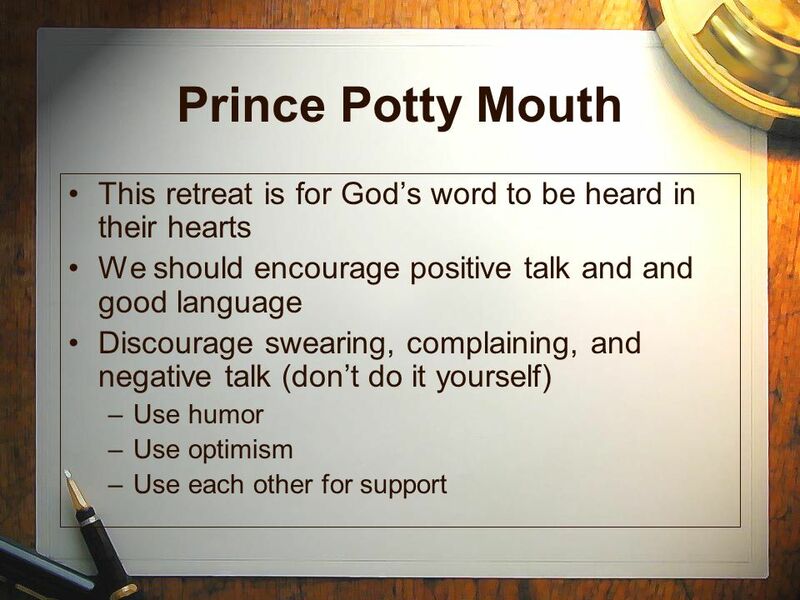 Acts Lesson 4 January 25. 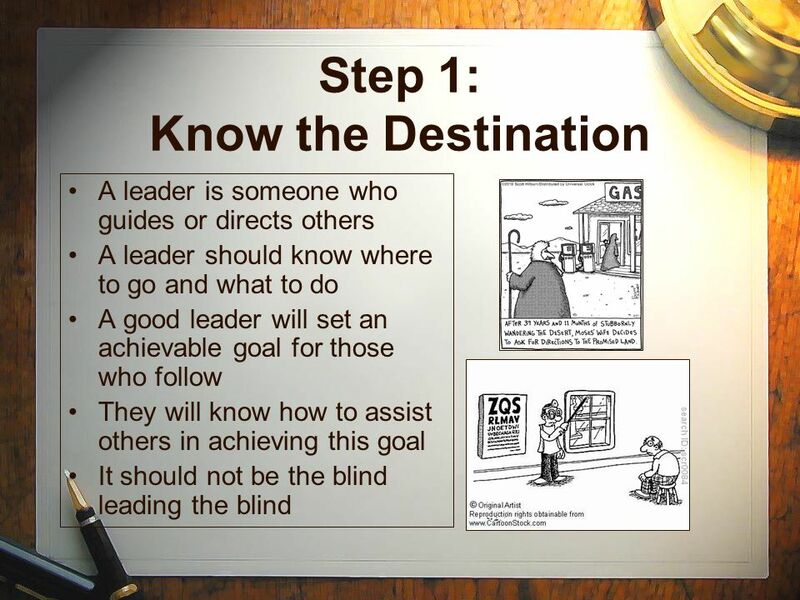 Think about it … What goals have you pursued as a member of a team? How has the team helped you endure the pain of reaching. Porter’s Procedures Answers to all of your “What if…?” needs. PRESENTED BY Peta- Ann Anderson RN/BSN Plantation Pathfinder Director August 3, 2013.